Yesterday, I was invited to eat lunch with a set of identical twins, whose names also both begin with the letter ‘D.’ Since the last time I had seen them was in January, I was looking forward to a scheduled rendezvous, especially since we would be eating at Perkins. Our waitress was incredibly pleasant, especially when she learned that the boys were from Elk Horn (the same place as the Danish Windmill). As she was originally from a neighboring town, she shared a little of her family history with us before taking our orders, which were turkey and gravy, a chicken BLT, and a “Triple Hero,” which D1 claimed to be. “No. Way.” They slowly sounded out, concluding that free pie Wednesdays at Village Inn was, by far, the best covenant in Council Bluffs. With that, D2 got up and went to the front, grabbing three coloring pages. His brother and I giggled in our tucked-away booth, watching as D2 asked the hostess where he could ‘locate some colors’. We shook our heads in laughter. “Oooooooooh,” I said with realization. 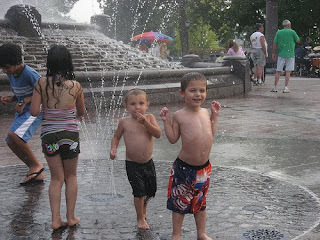 Being that it was 90-something-percent-humidity and about the same temperature, the cool water spraying up from the Kids Fountain at Bayliss Park felt wonderful. Though we felt awkward at first—as we were surrounded by a dozen small children and their parents—we took our turns walking straight through the water spewing up from the ground like Old Faithful—only not as powerful, and slightly more intricate. By the time I was ready to head home, I felt wonderful. It had been fun hanging out with the twins, luxuriating in the simple things that Council Bluffs offered. I can only imagine what we’ll do next week... perhaps another go?